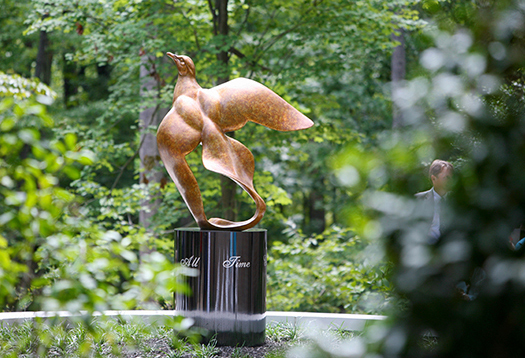 The William & Mary Memorial Garden was dedicated in November 2010 and serves as the final resting place for members of the William & Mary family. A plaque on the surrounding brick wall commemorates each person whose ashes are placed in the garden. This memorial garden was made possible by private donations. "We ask that this be hallowed ground, set aside from the wider College campus. We pray for your sons and daughters who will come home at the last, at the end of their days, to a place where they have been happy. 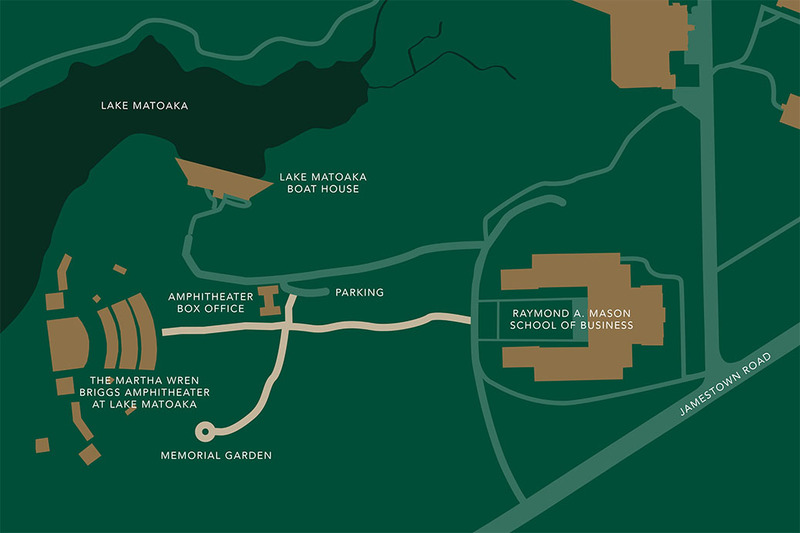 We pray for all who will come home to be laid to rest here, as to our mother's home once more, to the home of alma mater, the College of William & Mary." 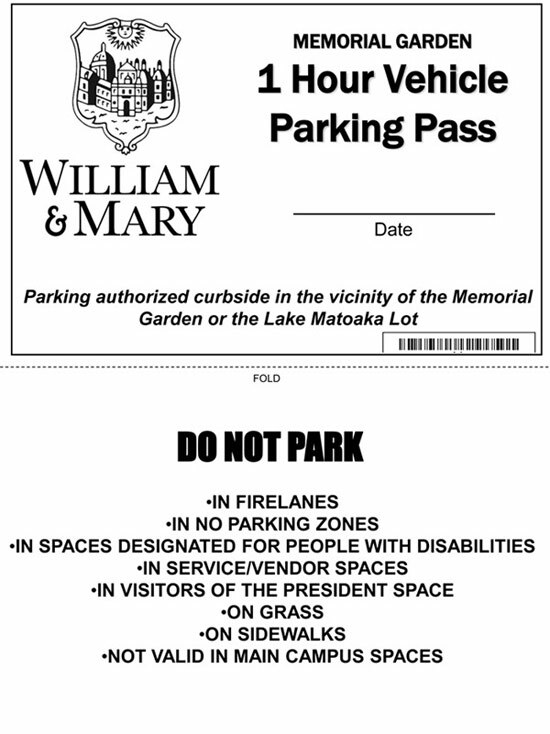 Alumni and friends wishing to pre-plan personal interment arrangements can do so by filling out the reservation form and remitting it with the full payment of $1,000 to the William & Mary Alumni Association. This charge includes site preparation, a 10" x 2" bronze plaque commemorating the deceased with name, class year, date of birth and date of death, and year-round maintenance of the Garden. The Memorial Garden is located in the Matoaka Woods near the Matoaka Amphitheatre. Take I-64 East toward Williamsburg/Norfolk. Take exit 234 (for VA-199) for about eight miles to John Tyler Highway/VA-5. Turn left and stay on Jamestown Road, Route 31for one mile. Turn left (on an unnamed drive directly behind the Mason School of Business. Turn left at the third entrance into the Matoaka Woods. Take your first left into a small parking lot. You can pull long the street side of the parking area; unless you have a state issued handicapped tag or license you cannot park in a handicapped space. Walk in front of the brick buildings and you will see a wooden Memorial Garden sign and walkway that will lead you to the Garden. Take I-64 West toward Williamsburg/Richmond. Take Exit 242A (VA-199) towards Jamestown/Williamsburg. Continue about 5.5 miles. Turn right on Jamestown Road, Route 31 for one mile. Turn left (on an unnamed drive directly behind the Mason School of Business. Turn left at the third entrance into the Matoaka Woods. Take your first left into a small parking lot. You can pull long the street side of the parking area; unless you have a state issued handicapped tag or license you cannot park in a handicapped space. Walk in front of the brick buildings and you will see a wooden Memorial Garden sign and walkway that will lead you to the Garden.